Paris, France - November 2, 2016 - ESI Group, leading innovator in Virtual Prototyping software and services for manufacturing industries, announces the latest release of Virtual Performance Solution (VPS). ESI's flagship software is a unique solution allowing manufacturers to face emerging design challenges - including those related to lightweight and green vehicles - while avoiding over-engineering. It enables design and simulation engineers to test rapidly their innovations on virtual prototypes, rather than real ones, and to evaluate the impact of real driving conditions. VPS also offers a distinctive approach, allowing the virtual testing of product performance across multiple domains, using a single core model. With this latest release of ESI Virtual Performance Solution, manufacturers can predict in a more efficient way the impact of use of composite and advanced lightweight materials on product performance, and simulate the vibration-induced noise. As automotive OEMs strive to develop lightweight vehicles, they continuously face challenges related to the introduction of new materials, new grades, and new processes. The selection of advanced lightweight materials, composite materials, ultra-high strength steels or aluminums can hardly be based on existing know-how. Rather, today's innovative multi-material strategies require a precise understanding, and an early prediction, of the as assembled behavior. Any level of uncertainty may lead to conservative decisions and costly over-engineering. Virtual Performance Solution 2016 offers new functionalities to help OEMs tackle challenges related to the introduction of new materials, and thereby enables them to design the next generation of lightweight vehicles. 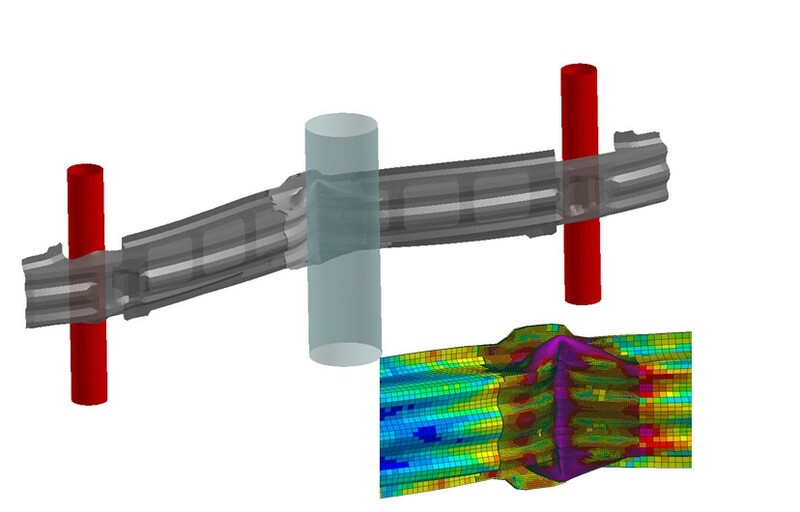 First, thanks to new dynamic re-meshing capabilities, the accuracy of rupture propagation after an impact is now better captured; important as engineers investigate in detail what happens in the crash rupture area when using new materials and novel assembly methods. Image: New dynamic remeshing capabilities during a bumper impact in ESI Virtual Performance Solution 2016. Another important challenge for car makers is meeting the new environmental regulations aimed at reducing the level of noise generated by cars. The European Commission recently introduced stringent new noise limitations, which will become applicable in 2026. In the case of electric and hybrid vehicles, which are exceedingly quiet, legislators are considering adding noise so as to reduce the risk of collision with pedestrians. To solve noise related problematics in an effective way, Virtual Performance Solution 2016 offers extended capabilities for Noise, Vibration & Harshness (NVH) and now enables the prediction of noise radiation, combining the Finite Element Method for the structure and the Boundary Element Method for the outside of the car. The same single-core model is used for the complete vehicle, which facilitates setting the correct pre-loading conditions; mandatory to high quality prediction of structural responses. To achieve greater accuracy, the single-core model also integrates frequency dependency and manufacturing history, even for very innovative and advanced materials and production processes. The use of this single-core model for all engineering teams delivers a drastic reduction of development cycles and costs. With this single core model, engineers can not only perform regulatory crash and NVH tests, they can also run virtual tests to evaluate real driving conditions. Thanks to VPS's water flow module, they can detect potential leakages and assess how rain will affect driving visibility. Find out more about water management with VPS. ESI Group is a leading innovator in Virtual Prototyping software and services. Specialist in material physics, ESI has developed a unique proficiency in helping industrial manufacturers replace physical prototypes by virtually replicating the fabrication, assembly and testing of products in different environments. Today, coupled with Virtual Reality, animated by systems models, and benefiting from data analytics, Virtual Prototyping becomes immersive and interactive: ESI's clients can bring their products to life, ensuring reliable performance, serviceability and maintainability. ESI solutions help world-leading OEM's and innovative companies make sure that their products will pass certification tests - before any physical prototype is built - and that new products are competitive in their market space. Virtual Prototyping addresses the emerging need for products to be smart and autonomous and supports industrial manufacturers in their digital transformation.